Is Vladimir Putin cloning Russian regional officials? The season of governors’ resignations/reassignments is at its peak in Russia. But some interim governors appointed by the president look so alike that many people are joking that they are doppelgangers secretly created by the government. “It looks like the new governors of Samara and Nizhny Novgorod can unlock each other’s iPhone Xs (with Face ID)” – this joke was doing the rounds on Russia’s Internet on Sept. 26, 2017. The pair of new politicians look very similar: They have brown hair, the same hairstyles and complexion, wear glasses, and were sporting almost identical suits on the day. Technically, these people are not yet governors: They are interims replacing resigned officials. Their regions are separate: Samara is 853 km east of Moscow, Nizhny Novgorod – 401 km. Samara’s Dmitry Azarov and Nizhny Novgorod’s Gleb Nikitin are not related at all. But boy, do they look alike. The situation predictably triggered lots of jokes. “Finally, we have the mass production of typical governors in Russia,” some online users exclaimed. Others posted pictures of clone laboratories from Star Wars and different sci-fi movies. Of course, these people are not clones but there is another similarity between the pair as Ura.ru points out: Azarov and Nikitin are both fairly young – 47 and 40 respectively – and have experience working at a federal level. Apart from those two, people also pointed out that among the other governors appointed in 2017, two share the same family name and patronymics: Gleb Sergeyevich Nikitin (Nizhny Novgorod) and Andrey Sergeyevich Nikitin (Velikiy Novgorod). Yes, even the cities they work in sound alike. It’s really easy to get confused. 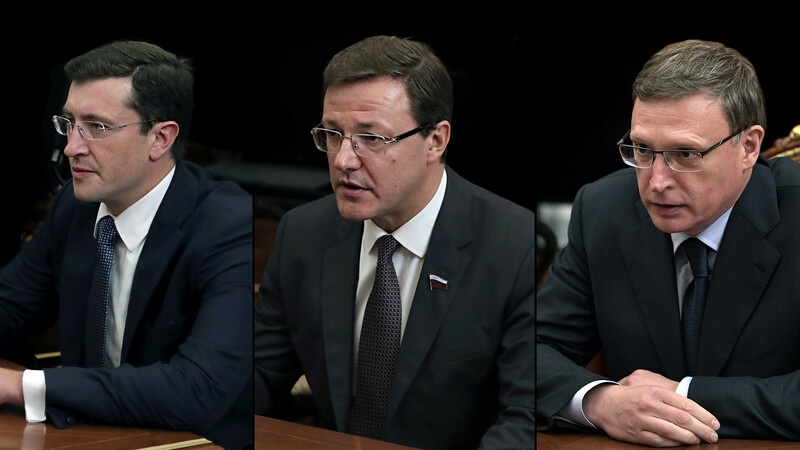 Gleb Nikitin, Dmitry Azarov, Alexander Burkov (from left to right) - three interim governors appointed by Vladimir Putin in autumn 2017. Unstoppable as he is, Putin appointed another interim governor on Oct. 9. Meet Alexander Burkov, the interim governor of Omsk (2,235 km east of Moscow). Does he remind you of anyone? Burkov’s hair is a bit greyer than his colleagues’ but otherwise he looks like their close relative (which he is not). According to one joke in the comments, it’s all about the haircut which is absolutely the same among the three men. Perhaps it’s just the official style? - Hello! What haircut would you like?